A lot of firsts this monday. first flight with a pro team. first travel in AAA hence the first flight. first time i can remember going through securtiy without my trusty backoack. first time ever on a plane with a tucked in dress shirt. wore somthing called “slacks” which are like pants. A few days ago Gilbert De La Vara and I were asked to sign autographs on the concourse an hour before our home game started. Every day, two players, typically bullpen pitchers who are unlikely to throw in that night’s game, head to the concourse for 30 minutes to sign for kids and adults alike. We sit in a booth that should say “The Dr. is IN” but instead says nothing. A lot of guys don’t like going up to sign because it takes away from their typical routine and perhaps they have something better to do with their endless hours in the clubhouse than sign autographs in public. For me, I try to make it enjoyable by saying funny things to kids. And then seeing if they get my humor. Most of the time they don’t but I chalk it up to nerves on their part and keep my chin up. I’ve signed on three occasions so far this year and have enjoyed every one of them. This most recent I enjoyed the most, though. Typically my fellow signer is a little less vocal and sticks to smiling and signing. I, on the other hand, try to ask kids where they’re from or how old they are or if their dad really thinks those shorts are flattering. I think it breaks the ice for everybody a little bit and makes fans feel comfortable asking the big famous baseball player for an autograph. As the half hour ticked away, a highlight was having a lady come up to me with a huge smile and ask me to sign a picture of me throwing a pitch. As I started to put the pen to the paper she stopped me, “No, please sign those amazing calves.” She asked, with now an even bigger smile. A blog fan! In the flesh, right before my eyes! She proceeded to tell me she checks the blog every day. So, sorry I didn’t ask for your name, but a big hello to you and thanks for putting a smile on my face. It made my day. And then, thankfully, I had the distinct privilege of having my day made for the second time by the guy a few feet behind the calf lady. He was wearing a hat and sunglasses. He approached our station and asked me to sign a picture and a ball for him. I said, “Of course,” and started to make small talk. I asked him if he was a regular at our games, asked where he was from, and who his favorite big league team was. We talked about his son’s little league team and about our game the night before. Then, once we were done chatting and his paraphernalia were signed, he sidled a few feet to his left and stooped his head down a few inches to make eye contact with the eyes below Tucson-native Gilbert De La Vara’s brim. In a slower, more deliberate manner, and nearly shouting, he asked Gilbert, “And what country are you from?” It was all I could do to hold the laughter in. I mean, it’s a reasonable question, there are plenty of Latin American baseball players, but Gilbert had been right next to us speaking in perfect English the entire time. In fact, Gilbert often gets made fun of when he tries to speak Spanish because it’s so broken. I was so grateful just to be a part of this awesome interaction. I also was excited to soon share with my teammates the conversation they were all missing. It would be a nice case to bring up in Kangaroo Court, too. The fan had asked it in the tone of voice you’d order Mongolian Beef and a Sprite: “What…COUN-try are YOU… from?” And then it got better. In every sense. “Arizona,” Gilbert replied. Again, in perfect English. I know I have taken donut analyses to a level probably unseen before and even more likely to levels undesired by anyone who hasn’t commented at least 3 times on the aforementioned entry. So, if you made the mistake of reading the entire donut entry and now see a headline with donut in it again, I’m giving you the heads up this one is not going to include any more analysis. It is, on the other hand, a wonderful follow-up story. For those of you who haven’t read the infamous donut debate, I will sum it up quickly here. I had a group of Harvard grads email me asking what was the ideal assortment of donuts to buy for their fantasy baseball league’s annual draft. As a side note, think of it as a field study, they also asked what would be the perfect assortment for my team’s clubhouse. I went into some lengthy research and in-depth formulas to create the “perfect combination” taking into account variety, health, quantity, and preference of donuts. It took hours and culminated in me running from our clubhouse in Midland, TX after our game had ended (where we were about to board a bus to Frisco, TX) to a nearby hotel so I could get Internet access to post my answer before the clock struck midnight on Friday night (June 5th, which happened to not-so-coincidentally be “National Donut Day”). After posting my discussion and conclusions, I ran back to the bus and by a matter of minutes avoided being left behind. We arrived safely in Frisco and I pitched the first game of the series on Saturday. Sunday afternoon at the field, as I always do, I asked our pitching coach for the game chart from the night before so I could make a copy and keep it for my records. But at the moment I was about to speak, he handed me the sheet of paper. I saw it wasn’t the game chart from the night before. He continued, “We’ve been here 2 years and we’ve never seen a guy on the road get a package delivered, but…” As he stuttered, I looked at the sheet he had handed me and it was a list. As I moved my eyes down the list I saw familiar notations: “Chocolate Frosted – 11, Sugar Raised – 11, Glazed – 11, Boston Kreme – 8,” and so on. My mind and the clubby’s ability to convey what he was finally trying to say converged at came together at the exact same moment. I laughed so hard, I coughed. I smiled so big my cheeks hurt. I was on cloud nine for the rest of batting practice, so excited to see my assortment before my eyes. 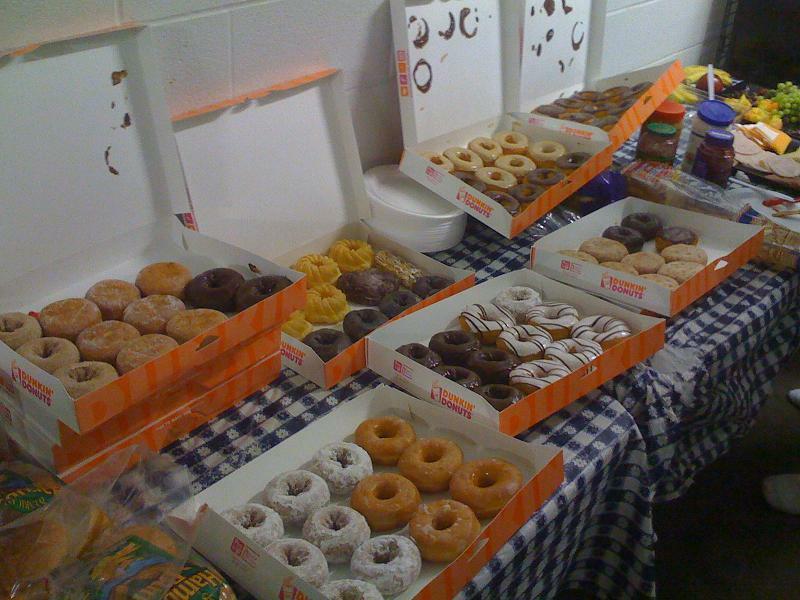 I couldn’t believe how thoughtful and downright hilarious it was for John to send the donuts. 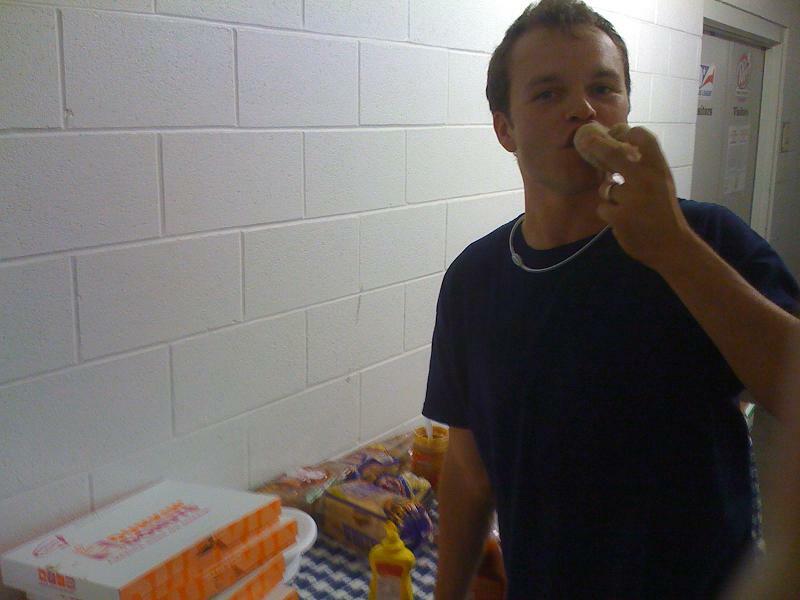 When we got back into the clubhouse, sure enough, in the EXACT quantities I had specified would be appropriate for the clubhouse, there were 10 boxes of Dunkin Donuts awaiting our team. I promised I wouldn’t do any analysis on this post, but I will say, in practice my assortment worked perfectly. 9 of the 10 dozen were gone by the end of the game that night. By the time we showed up to the field the next day, the last dozen was grabbed by guys on the way in. There was a good variety all the way down to the end, so it wasn’t like there were eight Sugar Raised left over that finally people had mercy on and ate. I was so touched by the thought and effort John W. put in I took a number of pictures so I could post in case you are in as much disbelief as I was while shagging BP. Though I’m an insanely picky and healthy eater, as you can see I did indulge in one cinnamon cake donut as promised in honor of John. Notice in the first picture (you can click on all of them to enlarge, btw) I couldn’t even fit all the boxes on the table. There’s 3 more dozen under the first box. 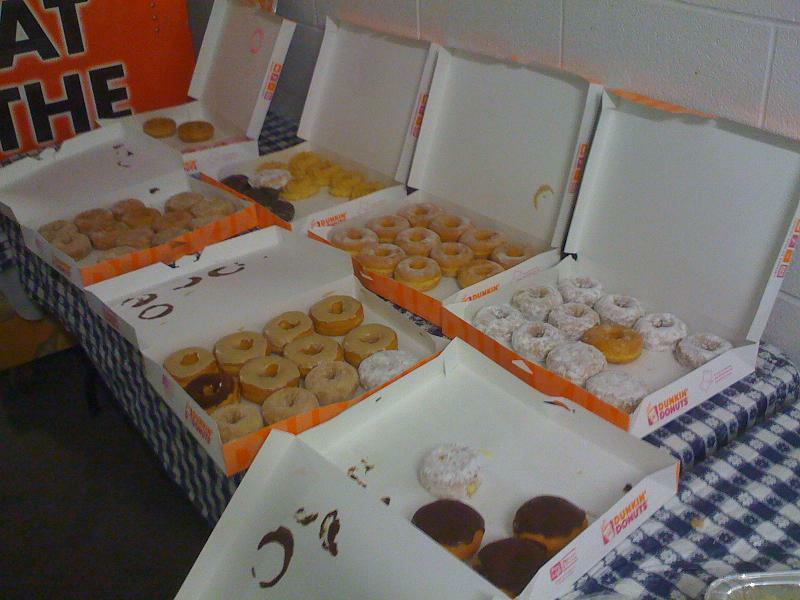 On the right, you can see the donuts starting to disappear. I posted my donut analyses at almost midnight on Friday night. By Sunday, that’s right, Sunday! (less than 48 hours later), at 2pm, there were 10 dozen donuts at my locker. These Harvard guys don’t mess around.